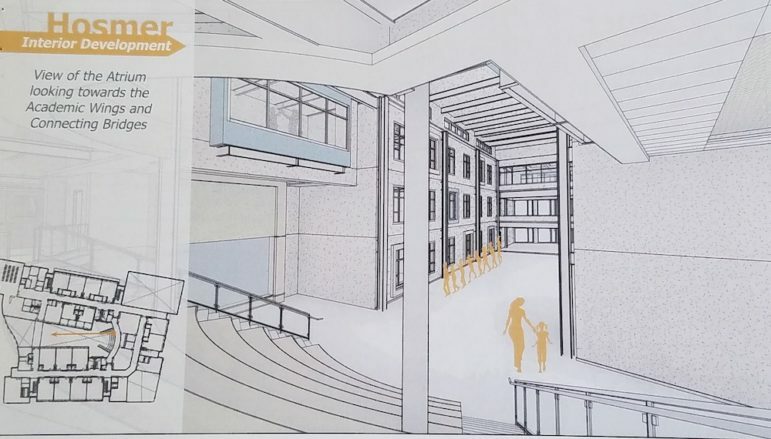 A look at what the inside of Hosmer School could look like. The view is from the top of the stadium seats in the learning commons, and looks down the atrium to the main entrance. The architects designing Watertown’s new elementary schools gave the School Building Committee a peek at what Hosmer, Cunniff and Lowell could look like after construction is complete. Scott Dunlap of Ai3 Architects showed what designers have come up with for what the outsides of the new buildings could look like. They have also laid out where the classrooms, gyms, cafeterias and other spaces would be located, even started to show where sinks and other fixtures could go in the rooms. Some of the layouts have changed since the proposals first came before the School Building Committee. The biggest project will be at Hosmer Elementary School. The current school will be replaced by a brand new school building. 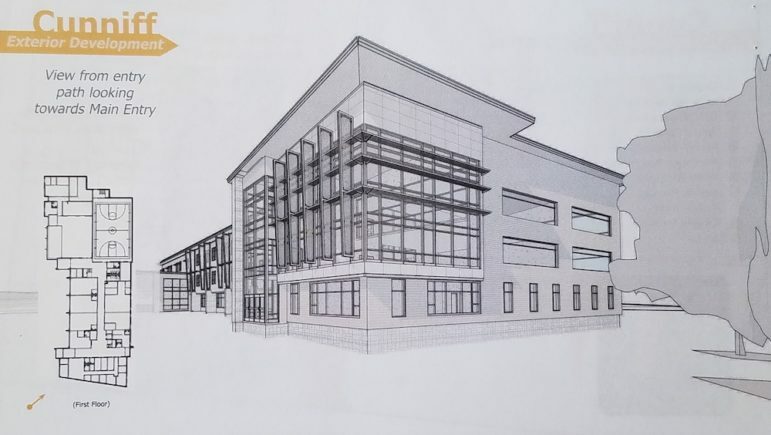 The main entry of the school will curve as it follows along the new front driveway, which will be an extension of Winthrop Street, Dunlap said. At the center of the building will be an atrium, beginning at the front entrance and ending at the learning commons, which will feature an amphitheater with stadium seating. Right in the front of the building will be the media center. Dunlap said preliminary plans called for the music room to be up front, but designers reconsidered after speaking with staff at Hosmer. While the main entrance will come off the new driveway, there will also be entrances so the public can access the gym and the cafeteria after school and on weekends. An illustration showing one corner of the new Cunniff Elementary School. This corner, closest to Warren Street, is where the learning commons and media center will be located. Architects did some reshuffling at Cunniff Elementary School, too. Like Hosmer, the Westside school will be completely rebuilt. When people enter the new school, Dunlap said, they will enter a two-story tall foyer. A walkway on the second floor will overlook the entryway. Cunniff’s music room was moved from the third floor to the first floor, Dunlap said. On the second floor will be the large group learning area, called the learning commons, and the media center (a library for the 21st Century) will be located on the third story. School Committee member Lindsay Mosca asked whether the flex rooms — which could be used for classrooms if the Cunniff enrollment grows — could move moved to the second floor rather than the third, where they are proposed to go. “Then you would not have grade levels separated by two floors,” Mosca said. The third floor has more space than the second, Dunlap said, because the gym and cafeteria are two-stories tall. The drop off and pickup area on Warren Street will be lengthened as much as possible, Dunlap added. An illustration of what the new wing at Lowell School could look like. Designers tried to integrate the new addition into the architecture of the historic school facade. Unlike the other two elementary schools, Lowell Elementary School will be a renovation project with a significant addition. 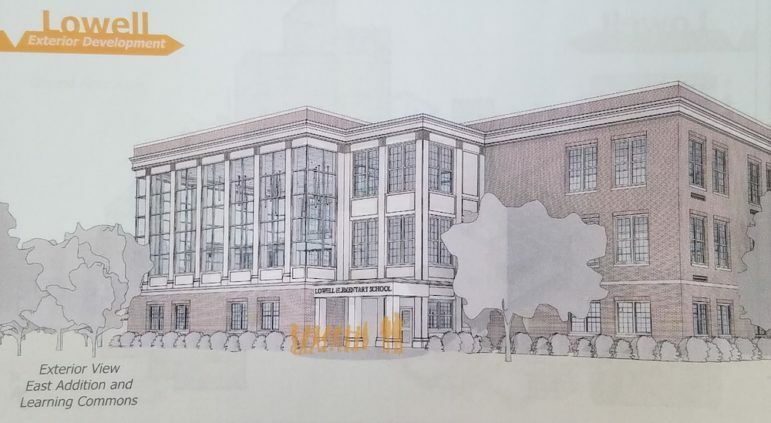 Architects have designed the new wing, on the east side of the building, to be modern, but to fit in with the historic look of the original school building, Dunlap said. On the corner of the new wing will sit the learning commons. This will be a two story space overlooking the front lawn and the historic facade. One thing that has yet to be resolved is where parking spaces can go to replace the parking area lost when the new wing is built. Dunlap showed a possible small parking area that could be created if Carlton Terrace is opened onto the school ground. Lowell Principal Stacy Phelan said that is the spot where kindergarten and first graders are dismissed. Town Councilor Vincent Piccirilli said that the road is a dead end, and is a common route for walkers. He added that there are no sidewalks on the road. Brian Hebeisen, a member of the Watertown Environment and Energy Efficiency Committee, asked whether Lowell could be made as energy efficient as the new buildings at Cunniff and Hosmer, where the goal is to have net zero energy efficiency. Dunlap said efforts will be made to make Lowell as energy efficient as possible, but because the fact that it is a renovation limits what can be done. “It will be more energy efficient than the current building, but it will not be like the new construction,” Dunalp said. While no schedule has been adopted, Ai3 included a potential timeline with demolition work beginning at Hosmer in late 2019, new construction beginning early 2020 and finishing in early 2022. The current classroom building at Hosmer would remain during the projects at Lowell and Cunniff so students from those schools could temporarily relocate to Hosmer. New additions at Lowell would start in mid-2021 and finish in late 2021, with renovation beginning early 2022 and ending mid 2022. Demolition at Cunniff would start mid-2022, and new construction would begin in the fall of 2022. The project would end in at Cunniff in fall 2023. When the work at Cunniff was finished, the final demolition of the current classroom building at Hosmer would take place in late 2023. Dunlap said that in the past he had always had that order of construction: Hosmer, Lowell, and then Cunniff. He said that architects have looked at the project and believe Cunniff and Lowell could be flipped. No decision has been made, however. Town Council President Mark Sideris, who chairs the School Building Committee, reminded the committee that no schedule has been adopted, and the timeline is just an example. What about the poor old high school? They are also working on the high school. That is a separate project. The School Building Committee will soon appoint an owner’s project manager, and then hire a designer. It all sounds great,but it’s about ten years to late. It may be ten years to late but hopefully it won’t take 10-20 before they’re complete as the timeline suggests. Is it possible to put the parking at Lowell below the playground? It’s to bad a new school couldn’t be put in at Lowell on the Hill in front of The old Lowell with all new systems and construction. Keeping the old building will cost more than it’s worth eventually in my opinion. When did they show the plans for the new buildings. They showed them at the School Building Committee meeting on March 6. How about the worsts school in town. The Highschool. It’s a health hazard!! !